Nitrous bottle racks have been around for just about as long as the bottles themselves, but support stands that even come close to those produced by Chris Alston’s Chassisworks are few and far between. Available for both single and dual bottle applications these exceptional mounting racks provide the ultimate in bottle security, convenience and unparalleled quality and fit. 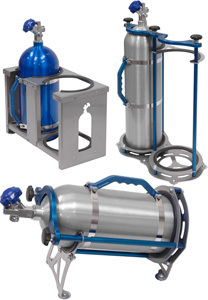 Individually crafted using a combination of steel and aluminum, Chassisworks nitrous bottle racks provide both weight savings and superior strength for industry standard 10 and 15 –lb., 6.90” diameter bottles. Stand up racks position bottles vertical to the floor while the lay-down style place bottles at a 15 degree angle to the floor. All contacting surfaces are fit with rubber guards to eliminate movement and scratching. Strategically placed steel top support and bottom plates are powder coated for a rugged, durable finish. Each of the custom fabricated billet components including, stand supports and interlocking latch mechanism, are anodized. Easy grip knobs and pivot arms make for quick release and replacement of bottles while the bottom stop plate eliminates positioning hassles. 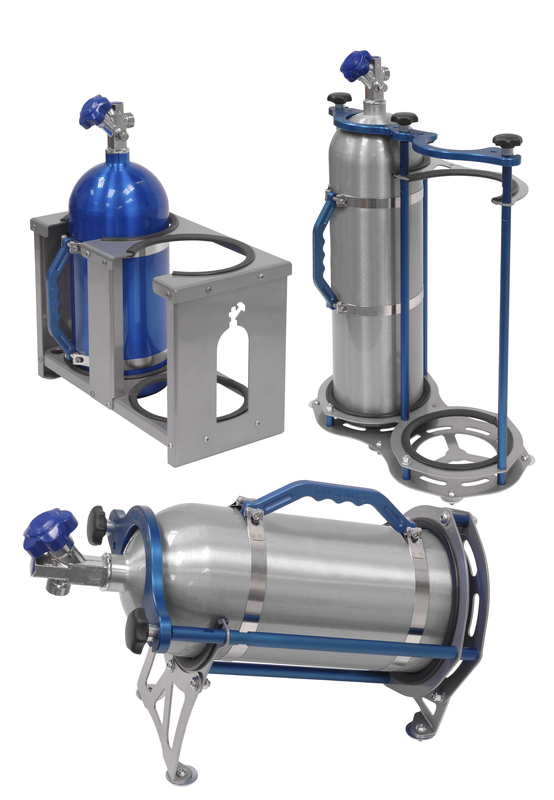 Ease of bottle removal and installation is further enhanced with the use of optional aluminum bottle grab handles and precision machined 9/16”, 11/16” nitrous bottle wrenches for -4 and -6 fittings. Additionally Chassisworks manufactures a sophisticated line of Bolt-In Trailer Racks. These storage racks are powder coated steel with rubber guards and provide the ultimate in safe and secure storage while at the track or on the road. Get all the fitment and option details by calling Chassisworks direct at 916-388-0288. Catch their complete line of high end suspension and chassis products at www.CAChassisworks.com.